Nintendo today announced Nintendo Labo, a wild new experiment for the Switch that will allow players to insert the console into assorted pieces of cardboard, creating items like robots, fishing rods, and pianos. 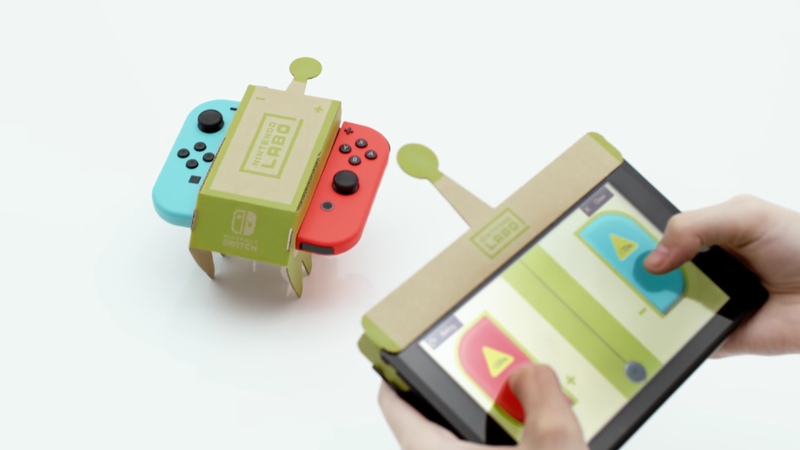 “Nintendo Labo combines the magic of Nintendo Switch with the fun of DIY creations,” the company explains on the Labo website. You’ll start with a piece of cardboard, which you can use to build one of these items, and then you’ll put the Switch in to power it up. Then you’ll be able to play games with your creations. The trailer, released this afternoon, shows people using their cardboard creations to play music and steer remote-controlled robots. It is insane and I love it. Nintendo Labo will be out on April 20, the company said. You’ll be able to buy two different sets, the Variety Kit (for $70) and the Robot Kit (for $80), and Nintendo is calling them both Toy-Cons, a play on the Switch’s Joy-Con controllers (because of course). Both kits will come with all of the cardboard and software you’ll need. You can also dish out $10 for a “Customization Set” including stencils, stickers, and colored tape to fix all the cardboard you and your kids break. Nintendo will be holding Labo events in New York City and San Francisco for kids who want to try out the ambitious new experiment.